As it turns out, unsurprisingly, America is not the only country suffering from a polarized political climate with arguments over public assistance, immigrants, and economic policies. And the people here are not afraid to be vocal about it. A few nights ago, Jesse and I were working on our computers and watching some football when we heard people banging what sounded like metal pots. We couldn’t tell at first if it was someone throwing a raging party or what. Over the next 90 minutes, the sounds of metal clanging, horns honking, and people whistling to the same beat told us it was definitely something more. Jesse found notices on the baexpats.org board about demonstrations going on in different parts of the city (and around the country) to protest the Kirchner government. A brief pause for a little info on current events/history: Cristina Fernandez de Kirchner is the current Argentine president in her second term and is the leader of the Peronist party. To read more about the political history of Argentina (aka Argentina’s modern history), the State Department actually has a pretty good summary, though it is a somewhat biased interpretation of the economic events and significance. Fernandez de Kirchner is also the widow of Argentine’s previous president, Nestor Kirchner – so the Peronists, and the Kirchners, have been in power since 2003. The Peronist party was started in the 40s based off of the philosophy of Juan Domingo and Eva Peron (yes, THAT Eva Peron) and is primarily nationalist and populist in nature. In fact, the “three flags” of the Peronist party are social justice, economic independence, and political sovereignty. Thank you Wikipedia. Also important is that in 2001, Argentina faced a HUGE economic crisis. The country and the economy has been a bit unstable ever since. I am certainly no authority on the Kirchner presidency or the economic/political climate of Argentina at the moment, but from what I understand, Kirchner’s policies have supported a generous welfare and immigration program and large economic changes aimed at bolstering Argentine economic independence. The government is neither capitalist and nor communist, but does enforce strict economic policies that limit individual and corporate freedoms in order to improve economic stability and primarily workers rights. The following is one example of how the government uses its economic power. Inflation of the peso has recently been quite a problem with an official rate of 10% and an unofficial rate of ~20% . Similarly, the official exchange rate with the US dollar is about 4.5 pesos to a dollar, but there is also a thriving blue/black market that values the peso at about 6.5 pesos to 1 US dollar. US banks will no longer buy pesos and it is actually very difficult to get US dollars here (more on this and the fun we’ve had exchanging money later). I was told yesterday that if you are Argentine and are traveling out of the country, you cannot just go into a bank to buy the foreign currency. When you purchase a plane ticket, you are given a number, which, about one week prior to your trip, you register with the government. They then decide, based on where you are going and how long you are going for, how much of the currency you are allowed to purchase, which is generally much less than what is needed for a trip. If you want to pull money out of an ATM or use your credit card abroad, you are charged an exorbitant fee by your bank or credit card company. So in an effort to curb inflation, the government dictates how much currency you are allowed to have when you travel abroad. Imagine how that would go over in the States. Students protesting the University conditions and low monthly stipend given to low-income students. Cut back to last Thursday. Many people, primarily those in the upper economic bracket, are very upset with the Kirchner government. They very vocally oppose many of the government’s economic and social policies. 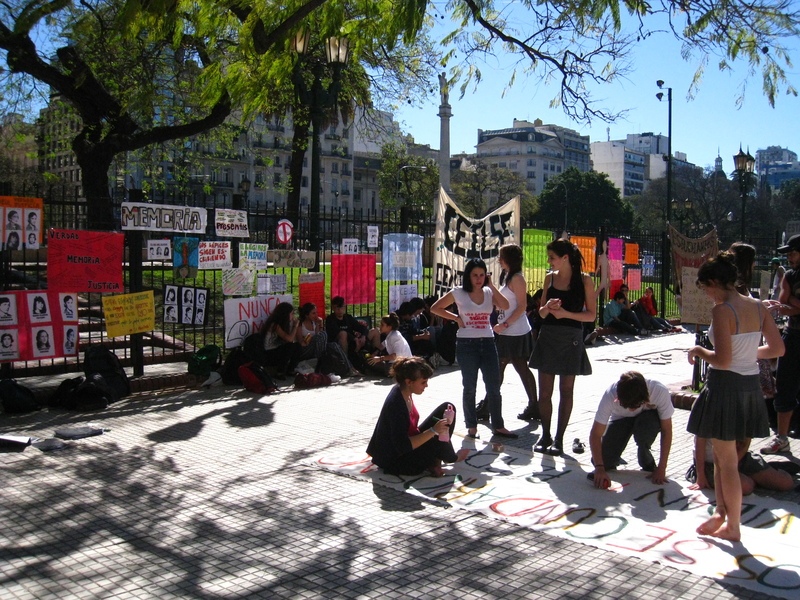 Argentines, in general it seems, are politically active or at least vocal. It is not as taboo to talk about politics here as it is in the States. People aren’t so scared about getting into disagreements. So those opposed to the Kirchner government had a march on Thursday evening. From what I hear it was big, but not quite as big as some of the media outlets would have you believe. Just like in the States, the media here has taken sides and does not necessarily present unbiased reporting. This was the first political encounter we’ve had here. I have to say, while I don’t know enough about the politics of it all right now to make an intelligent and well informed comment on the actual debate, it is quite refreshing to see people taking a stand for what they believe in. And even more refreshing is that they are not considered to be crazy or hippies or disturbing the peace as a lot of the Occupy Wall Street folks were seen. When I studied abroad in France, one of the things that struck me was the political activism and political IQ of all the citizens, from teenagers to union workers to businessmen. They know about the policies, they understand the implications, and they discuss their opinions respectfully. It’s a really healthy (or at least it seemed that way to me) political conversation. People there, as it seems they do here, believe it is their right to be involved in their government and that their actions can actually directly affect change. We in the US seem so worried that we’re going to offend another person that we don’t discuss the issues, and when we do it isn’t necessarily in a constructive manner. Even on Facebook, I see people saying “Please don’t post your political views up here! I don’t want to hear it.” If we can’t comment and discuss amongst friends (and I repeat, respectfully), where can we do it? When are we ever going to have a good conversation and more importantly try to understand each other? I’m not saying that it’s all rainbows and butterflies here – from what I’m told, people do have rather polar opinions and reactions – but there is something I think we can learn about being active and engaged citizens.